I love data visualization make-overs (like this one I wrote a few months ago), but sometimes the tone can be too negative (like this one I wrote a few months ago). 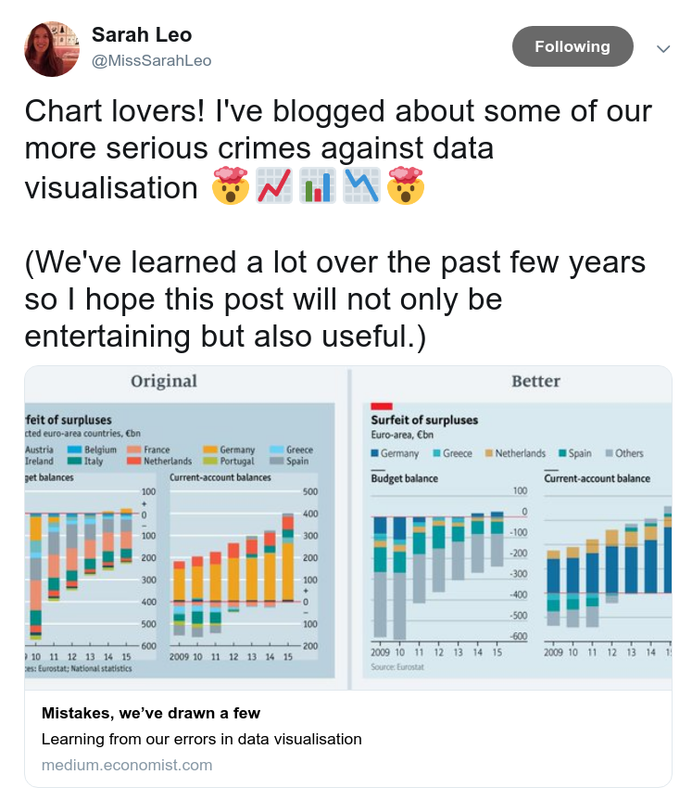 Sarah Leo, a data journalist at The Economist, has found the perfect solution: re-making your own visualizations. Here’s her tweet. And here’s the link to the article, which you should go read before you come back here. 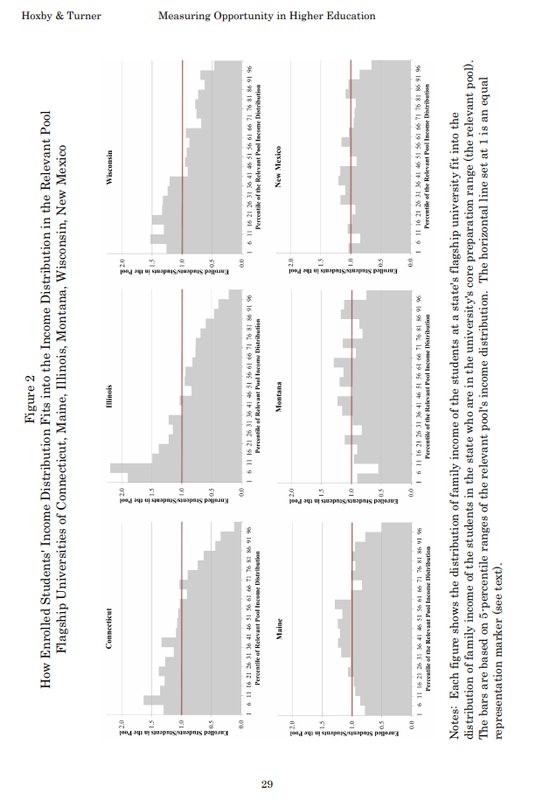 One of her examples is the noisy line plot on the left, which shows polling results over time. 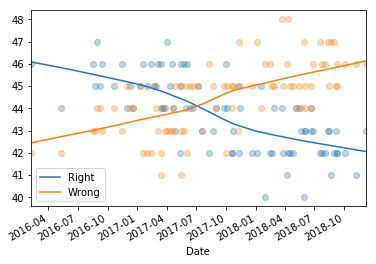 Instead of plotting the individual polls with a smoothed curve to show the trend, we connected the actual values of each individual poll. This happened, primarily, because our in-house charting tool does not plot smoothed lines. Until fairly recently, we were less comfortable with statistical software (like R) that allows more sophisticated visualisations. Today, all of us are able to plot a polling chart like the redesigned one above. This confession made me realize that I am in the same boat they were in: I know about local regression, but I don’t use it because I haven’t bothered to learn the tools. Fortunately, filling this gap in my toolkit took less than an hour. The StatsModels library provides lowess, which computes locally weighted scatterplot smoothing. The smoothed lines I got look a little different from the ones in The Economist article. In general the results depends on the parameters we give LOWESS. You can see all the details in this Jupyter notebook. 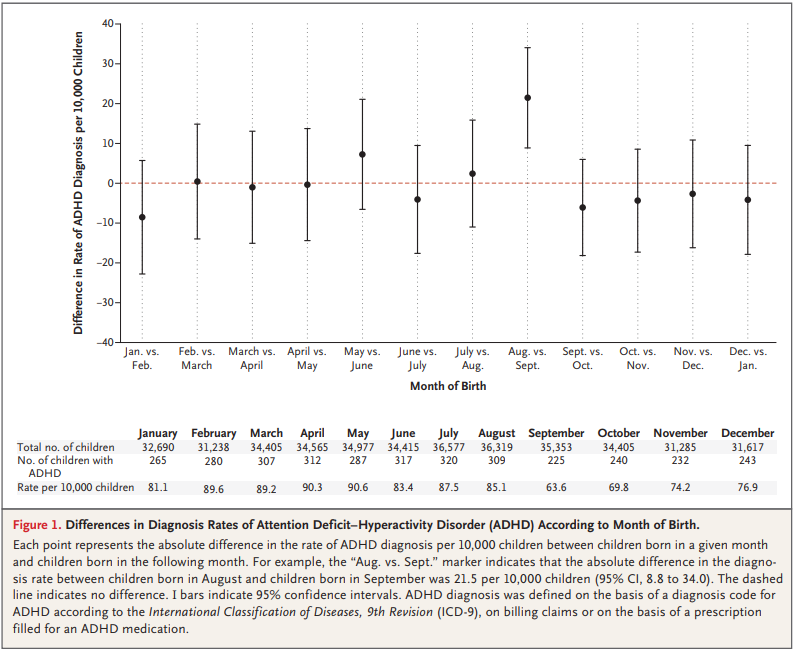 Thanks to Sarah Leo for inspiring me to learn to use LOWESS, and for providing the data I used to replicate the results. The following are abstracts from 13 projects where students in my Data Science class explore public data sets related to a variety of topics. Each abstract ends with a link to a report where you can see the details. What is the Mother Tongue in U.S. Communities? Heroin and Alcohol: Could there be a relationship? Does Health Insurance Type Lead To Opioid Addiction? Back in my hometown, many people consider themselves middle class regardless of their incomes. I grew up confusing income class with subjective class. Now that I am living in a new environment, I am curious to see whether a discrepancy between subjective and income class exists throughout America. 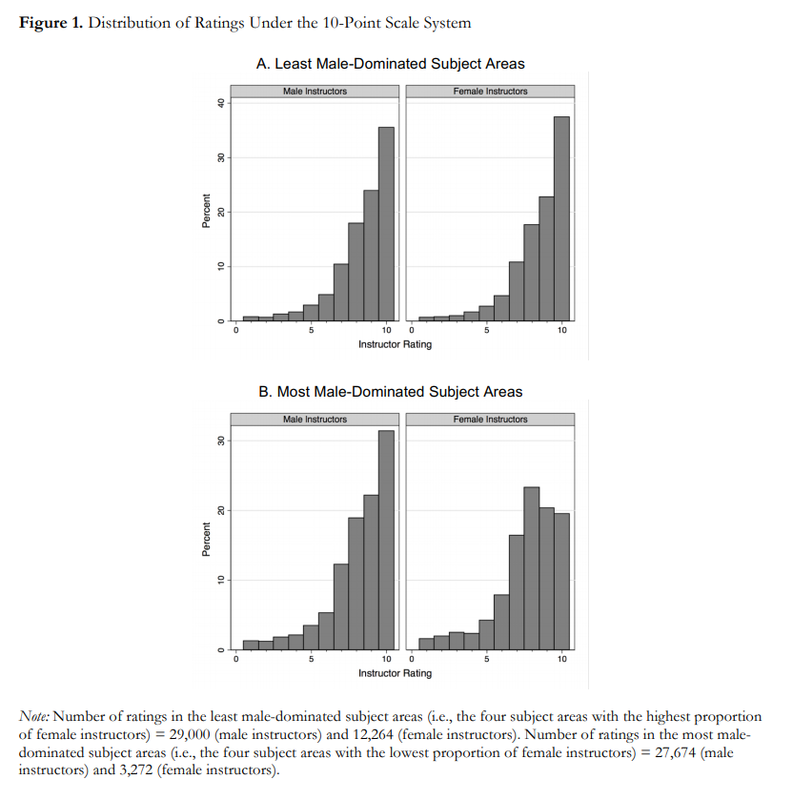 The main question I want to answer is: how does subjective class compare to income class? 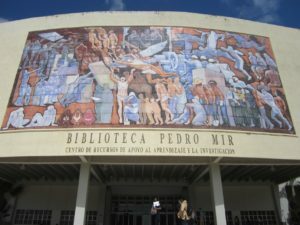 In many engineering classes, computational methods are treated with fear, uncertainty, and doubt. At the same time, analytic methods are presented as if they were magic. I think we should spend more time on computational methods, which means cutting back on analytic methods. But I get a lot of resistance from faculty with a dread fear of black boxes. They warn me that students have to know how these methods work in order to use them correctly; otherwise they are likely to produce nonsense results and accept them blindly. And if they let students use computational tools at all, the order of presentation is usually “bottom-up”, that is, a lot of “how it works” before “what it does”, and not much “why you should care”. In my books and classes, we often got “top-down”, learning to use tools first, and opening the hood only when it’s useful. It’s like learning to drive; knowing about internal combustion engines does not make you a better driver. Many black boxes can be used safely; that is, they produce accurate results over the range of relevant problems. In that case, we should ask whether it (really) helps to know how they work. In Scenario 1, the answer is no; we can stop worrying, stop teaching how it works, and use the time we save to teach more useful things. Of course, some black boxes have sharp edges. They work when they work, but when they don’t, bad things happen. In that case, we should still ask whether it helps to know how they work. In Scenario 3, the answer is no again. In that case, we have to teach diagnosis: What happens when the black box fails? How can we tell? What can we do about it? Often we can answer these questions without knowing much about how the method works. But sometimes we can’t, and students really need to open the hood. 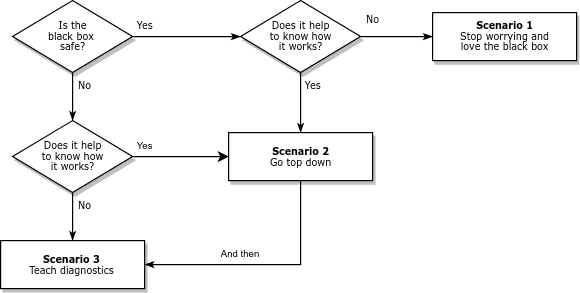 In that case (Scenario 2 in the diagram) I recommend going top down. Show students methods that solve problems they care about. Start with examples where the methods work, then introduce examples where they break. If the examples are authentic, they motivate students to understand the problems and how to fix them. The engineering curriculum is designed on the assumption that we are always in Scenario 2, but Scenarios 1 and 3 are actually more common. On February 13 I presented a webinar for the ACM Learning Center, entitled “The Bayesian Zig Zag: Developing Probabilistic Models Using Grid Methods and MCMC“. Eric Ma served as moderator, introducing me and joining me to answer questions at the end. The example I presented is an updated version of the Boston Bruins Problem, which is in Chapter 7 of my book, Think Bayes. At the end of the talk, I generated a probablistic prediction for the Bruins’ game against the Anaheim Ducks on February 15. I predicted that the Bruins had a 59% chance of winning, which they did, 3-0. Does that mean I was right? Maybe. If you did not watch it live, you can view the recorded webinar at no cost other than registering and providing contact information. Here are the slides I presented. And here is a static view of the Jupyter notebook with all of the code and results. You can also run the notebook on Binder. Thanks to the ACM Learning Center for inviting me, to Eric for moderating, and to Chris Fonnesbeck and Colin Carroll for their help developing the example I presented. Are men getting married later or never? Both. 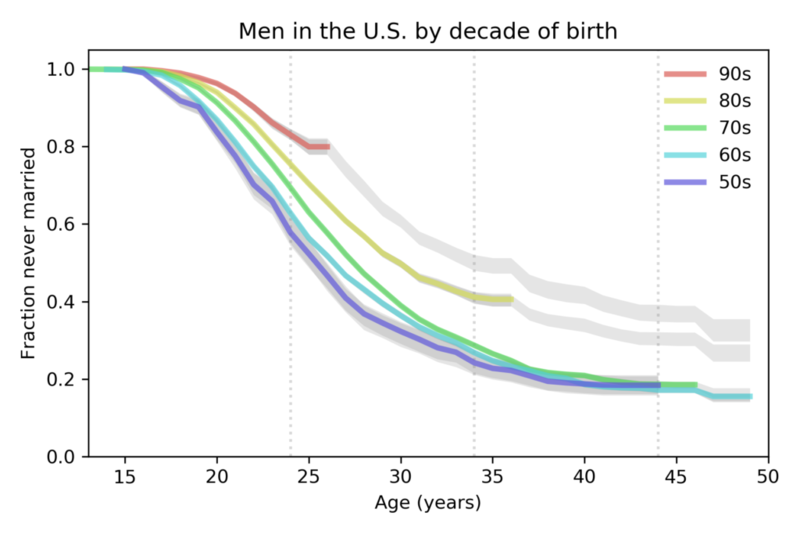 Last week I wrote about marriage patterns for women in the U.S. Now let’s see what’s happening with men. From one generation to the next, men have been getting married later. The median age at first marriage for men born in the 1950s was 26; for men born in the 1980s is it 30, and for men born in the 1990s, it is projected to be 35. The fraction of men never married at age 44 was 18% for men born in the 1950s, 1960s, and 1970s. It is projected to increase to 30% for men born in the 1980s and 37% for men born in the 1990s. Of course, thing could change in the future and make these projections wrong. But marriage rates in the last 5 years have been very low for both men and women. In order to catch up to previous generations, young men would have to start marrying at unprecedented rates, and they would have to start soon. For details of the methods I used for this analysis, you can read my paper from SciPy 2015. And for even more details, you can read this Jupyter notebook. As always, thank you to the good people who run the NSFG for making this data available. Last month The National Survey of Family Growth released new data from 5,554 respondents interviewed between 2015 and 2017. I’ve worked on several studies using data from the NSFG, so it’s time to do some updates! The vertical axis, S(t), is the estimated survival curve, which is the fraction of women who have never been married as a function of age. 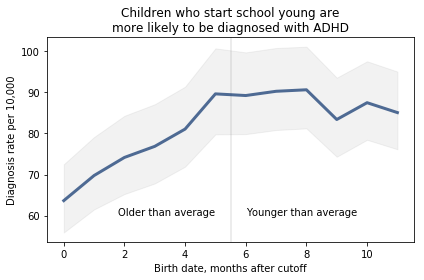 The gray lines show projections based on the assumption that each cohort going forward will “inherit” the hazard function of the previous cohort. 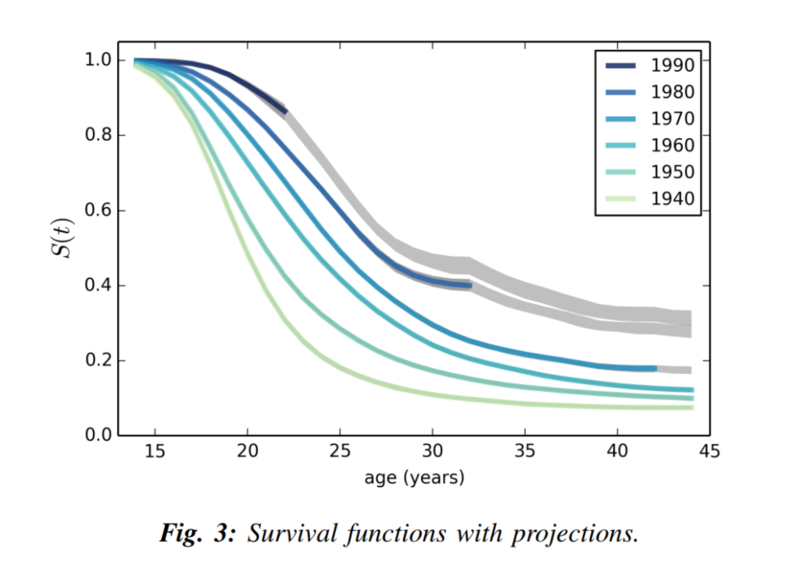 If you are not familiar with survival functions and hazard functions, you might want to read the SciPy paper, which explains the methodology. Age at first marriage has been increasing for decades. Median age at first marriage has gone from 20 for women born in the 1940s to 27 for women born in the 1980s and looks likely to be higher for women born in the 1990s. The fraction of women unmarried at age 44 has gone from 7% for women born in the 1940s to 18% for women born in the 1970s. And according to the projections I computed, this fraction will increase to 30% for women born in the 1980s and 42% for women born in the 1990s. 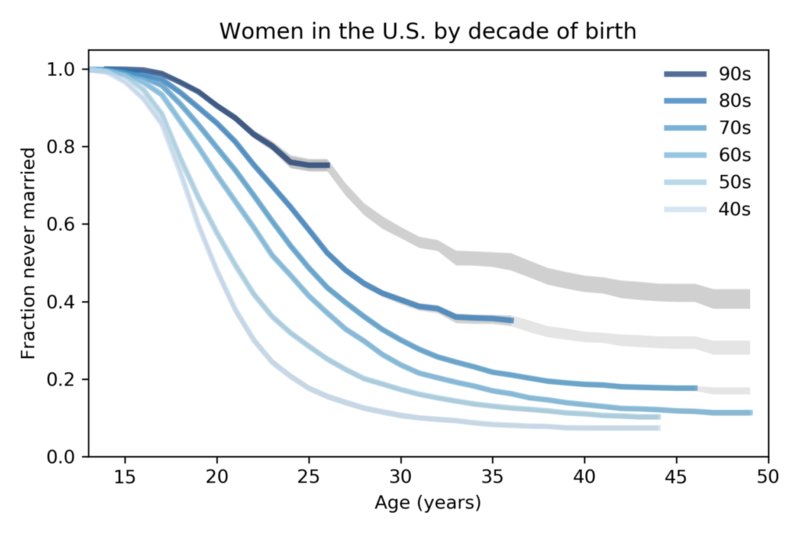 For women born the 1980s and 1990s, the survival curves have been surprisingly flat for the last five years; that is, very few women in these cohorts have been married during this time. This is the “marriage strike” I mentioned in the SciPy paper, and it seems to be ongoing. Because the marriage strike is happening at the same time in two cohorts, it may be a period effect rather than a cohort effect; that is, it might be due to external factors affecting both cohorts, rather than a generational change. For example, economic conditions might be discouraging marriage. If so, the marriage strike might end when external conditions change. But at least for now, it looks like people will continue getting married later, and substantially more people will remain unmarried in the future. In my next post, I will show the results of this analysis for men. 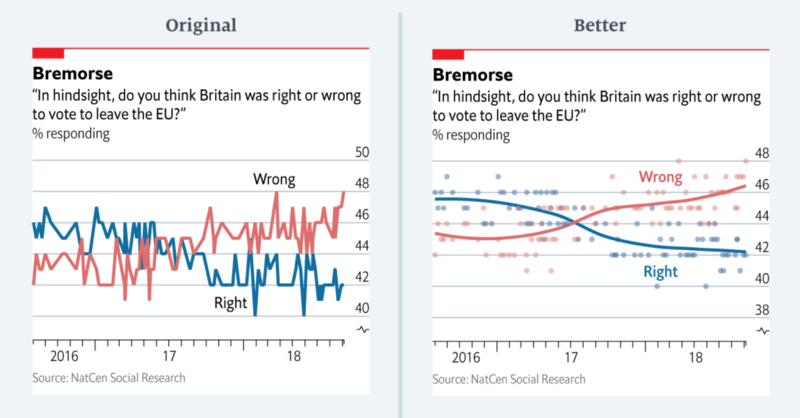 In their November 3, 2018 issue, The Economist published the following figure showing their analysis of data from YouGov. For the second edition of Think Bayes, I plan to use it to demonstrate conditional probability. In the following notebook, I replicate their analysis (loosely!) 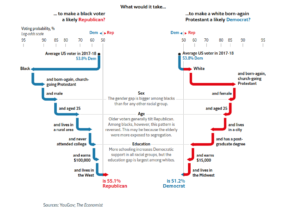 using data from the General Social Survey (GSS). All of my books were written in LaTeX. For a long time I used emacs to compose, pdflatex to convert to PDF, Hevea to convert to HTML, and a hacked-up version of plasTeX to convert to DocBook, which is one of the formats I can submit to my publisher, O’Reilly Media. Recently I switched from emacs to Texmaker for composition, and I recommend it strongly. I also use Overleaf for shared LaTeX documents, and I can recommend that, too. However, the rest of the tools I use are pretty clunky. The HTML I get from Hevea is not great, and my hacked version of plasTeX is just awful (which is not plasTeX’s fault). I got some great responses. You can read the whole thread yourself, but I will try to summarize it here. Yves Hilpisch says “AsciiDoctor is my favorite these days. Clear syntax, nice output, fast rendering (HTML/PDF). Have custom Python scripts that convert @ProjectJupyter notebooks into text files from which I include code snippets automatically.” His scripts are in this GitHub repository. Robert Talbot recommends “Markdown in a plain text editor, with Pandoc on the back end for the finished product. This is assuming that the book is mostly text. If it involves code, I might lean more toward Jupyter and some kind of Binder based process.” Here’s a blog post Robert wrote on the topic. I got a recommendation for this blog post by Thorsten Ball, who uses Markdown, pandoc, and KindleGen. One person recommended “writing Markdown then using pandoc to pass to LaTeX”, which is an interesting chain. For now I am working in LaTeX with Texmaker, but I have run it through pandoc to generate AsciiDoc, and that seems to work well. I will work on the book and the conversion process at the same time. At some point, I might switch over to editing in AsciiDoctor. I also need to do a test run with O’Reilly to see if they can ingest the AsciiDoc I generate. I will post updates as I work out the details.